I made Square-rific! from my first two fabric lines, Best. Day. Ever! and Meadowbloom, both by Moda fabrics. It was the first project I made mixing the two lines, and I couldn’t have had more fun with it. In fact, my quilt is probably a little brighter than the rest in the book for that reason! I had just gotten my advance yardage for Meadowbloom when I started making this quilt, and I couldn’t help but use it, even if it was just a bit louder than the proposed color scheme. :) Y’all know how I feel about color. So. Scraps, Inc. Vol. 2. It’s amazing. The designers who contributed are ridiculously talented, the photos are beautiful, and the patterns are awesome. You’re going to want to get your hands on this one. If you have the first Scraps, Inc. book, you already know this. Or, if you just don’t want to leave it to chance, Lucky Spool and Taunton (publisher and distributor) are offering 30% off through the end of this blog hop on all preorders (ships 2/22). Just skip on over to this link, and enter code Scraps30. I love my first Scraps Inc book!! Can’t wait for this one!! I would love to see your Whirlwind pattern as a mini! Grand Parade would look good as a mini Quilt, in my opinion. Lovely fabrics in the new line. Radiant is beautiful! Not sure how hard it would be to miniaturize it but I sure do like it! I would love to see your pattern Miss America in miniature. Thanks for the chance to win your fantastic book. Your quilt looks fabulous. The way you set it together is really unique! I would love to see radiant or modern hex in a mini! Love the bold use of colors and I have tons of square scraps so always looking for inspiration. Modern Hex or Whirlwind! I would also love to see Dahlia, a single Dahlia, in a lap size quilt, just in case you ever ask the reverse question. All your patterns are beautiful. Thank you for the chance! I’d love to see Parcheesi in a mini! I would live to make a mini Miss America!! I love Square-rific and Solstice best! I love your use of color in all your quilts. I have some of your first lines of fabric! I have Russian Rubix as a full size – how about making that mini? Looks like a great book! I think Sweetie Pie would make an adorable mini! Modern Hex would be my first choice for a mini version. Thanks for an opportunity to win this great new book! HELLO,such neat ideas! I think “Grand Parade” would be a cute Mini! Thank You for sharing a great giveaway! You know, I’ve never made a mini quilt, but I think the Radiant pattern would be cute as a mini! I’d love to win this fun book. I’d like to see Building Blocks in a mini quilt size. Love seeing the projects from this book! I think I would like to see Whirlwind as a mini quilt. Thank you. Solstice because I especially love it. Tiny squares would definitely involved! It was very difficult, but I’d like to see Whirlwind in a mini. Really, anything from your fabric lines is always beautiful. Just lovely. I’d also love this book. Especially with your work in it. I think “twinkle” would be a fun mini. Love your Scrap-rific, but I want to call it Scrap-alicious! I think a mini Miss America would be da bomb! I may have to click over and get a copy now. *wink!! I’d love to see a Radiant mini! I’d like to see Modern Hex as a mini pattern. I had a great time making a version of your Russian Rubix pattern. I am using some of the leftover octagons for another quilt with 9 patches. I’d love to see a mini version of that quilt. I love the brightness of Squarific! Russian Rubix…I LOVE it! 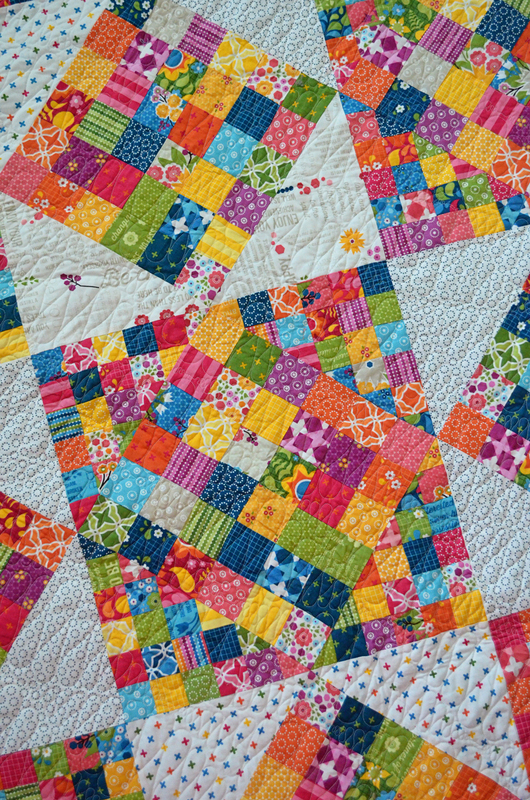 Your quilt in this new book is fabulous too! I’d like Morocco. Or dahlia. Hard to pick just one! Would love a mini of modern hexies – if that’s even possible. Thanks so much – the book looks scrapilicous! Jigsaw looks like it would be a fun mini! I’m obsessed with both Meadowbloom and Solstice, you have my vote! I’ll bet have the world’s largest Meadowbloom stash. I love Big City: Quilting Pattern # 113 and think it’s be great in a lap size. Thank you for a chance to win. I can’t wait to see the book. 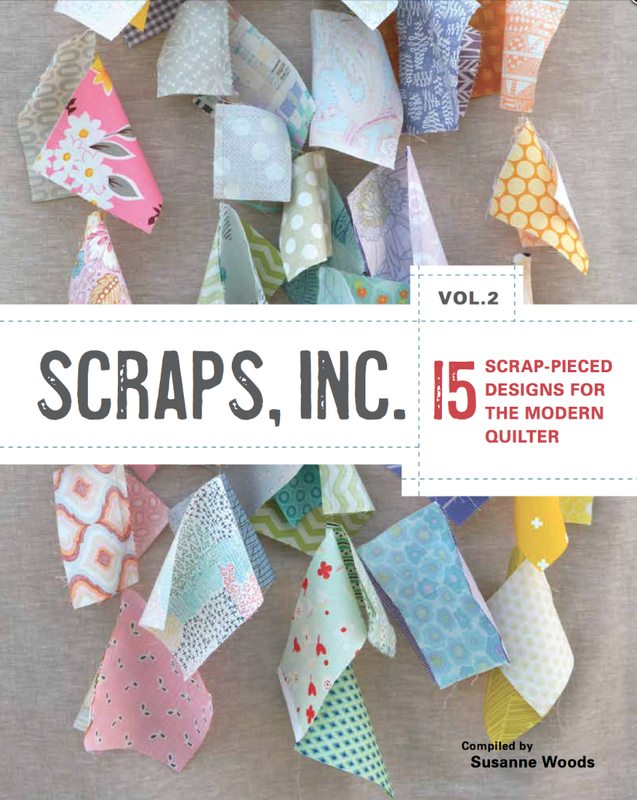 Can’t wait to see the new Scraps Inc book. For free? Yes please! I’m choosing Whirlwind as well. Miss America or Overcast! I can’t wait to get a copy of Scraps, Inc Vol 2! Building blocks would be fun as a mini! Oh, my goodness. What talented artist you are. All those beautiful patterns. I vote Russian Rubix and JIGSAW!! Please, please. I would love to see Leaflet as a mini quilt pattern. So hard to decide as they are all great! Whirlwind would be a pretty mini quilt. Whirlwind would look lovely as a mini! I love your quilts. I would like to see modern hex. Radiant would be fun with lots of little hst’s! Parcheesi would be fun in a mini. Russian Rubix would be fun and possibly maddening. Don’t Stop would be almost as fun and not so maddening. Great looking scrap quilt! WOuld truly brighten up a day. Not to be a pain but I don’t really like minis so I wouldn’t be a great one to advise. I like to make big quilts so they are useful not just decorative. But I love to use scraps. I just made a scrappy bag and IPad cover using both of your lines. Love them and you. Thanks. Would love to win the book – it looks great!! I think Whirlwind would look great as a mini! Love your quilt! I’m so excited about this book. I’d love to see a mini of your Modern Hex pattern. Thanks for the giveaway! I may be crazy but I think Solltice would be a great mini. Hard to choose one, but I would love to see Twinkle in miniature sizes! The new book looks wonderful. Thanks for the chance to win it! I am loving the quilts you all did in this 2nd volume! I would love to see Mind Gap in a mini … and several others even though I’d never be able to make them! Thank you for this giveaway chance. I’d love to see the grand parade in a mini. I love that quilt. This new book sounds like a treasure for my sewing room. I think whirlwind would make a great mini. Modern Hex would be great in a mini quilt pattern! It offers such possibilities! Radiant would be my choice. yes I believe I love color just as much as you apparently do. Yay to color. I love the Solstice quilt. Could you possibly do that in a mini version? First Date in a mini. I’d frame ’em and give to brides-to-be as a shower gift or on their wedding anniversary to remind of ’em of their true love. I think Dahlia would be a great mini! I am new to you and I love your work! I would choose Radiant. Its a beautiful quilt. I’d like the Flirty in a mini size. I like your Squares quilt. Have always been a fan of postage stamp type quilts, but I suppose there’s a limit as to how “mini” you can make them. Personally I like quilts that one can warp up and snuggle in. Would love to win this book. Please make a mini Miss America that would be great! And your Square-rific looks amazing! I’d like to see Miss America as a mini. I can’t wait to get a copy of Scraps. I would like to see Flirty as a mini quilt. 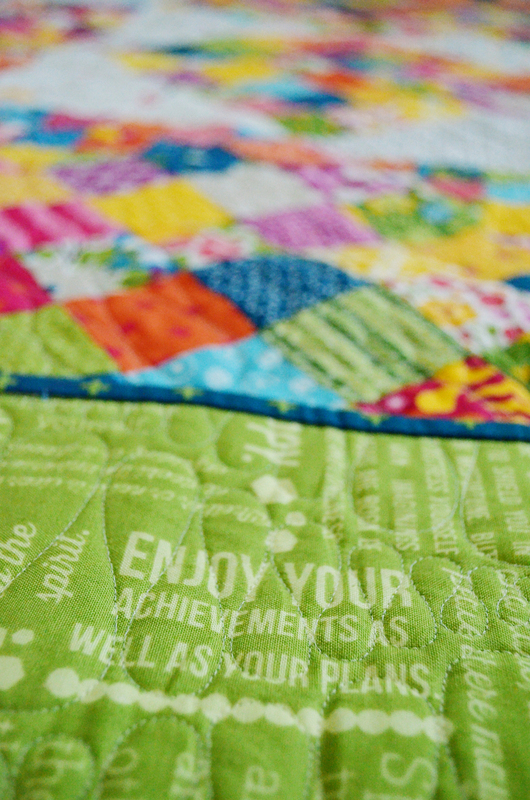 Love your scrappy quilt, one i’d be sure to make. I like to modern hex as a mini. Thanks for the chance to win scraps volume 2. I really like volume 1. “Whirlwind” is screaming “mini” to me! Flirty would make a great mini! Either whirwind or solstice! Love them both! And this book looks amazing! Solstice would be my pick for a mini! I think Whirlwind would be a gorgeous mini, although likely a challenge to piece! I think your “Modern Hex” pattern would be a great mini. And this book looks terrific. I think Jigsaw would look good as a mini quilt. Keep quilting! 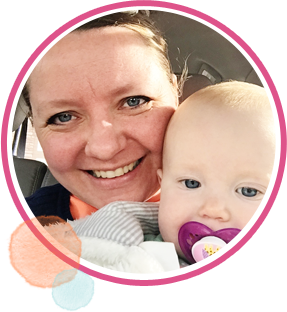 This is my first visit to your blog but won’t be my last! I really like your patterns so it was hard to narrow it down to one for a mini quilt pattern. But, I think Parcheesi would make a fabulous mini quilt. Thanks for the opportunity to win a copy of the new book. Wow, such a beautiful quilt, love the loud colorway! Whirlwind would be fun as a mini. I’d love to see Solstice in a mini! I’d like to see Solstice as a mini. Modern Hex is my favorite! I am a sucker for the Dahlia- that would be pretty as a mini for sure! I can’t pick just one! I love all quilts as minis. I think Radiant would be great as a mini quilt. I really love your Russian Rubix and Parcheesi patterns, but I’d love to see Sweetie Pie made into a mini. This looks like the perfect solution to my overflowing scrap problem that is overtaking my quilting space …. love your blog. I love grand parade and flirty! I have them both but minis would be so fun! I love your fabric and your bright quilt. Grande parade…id like to see. Modern Hex would make a great Mini. Love the quilts in this book. I’ve love Dahlia since it first came out, so I would love to see a mini version of it. Love the new fabric too. Thanks for all you do to keep the world beautiful! Miss America would be cute in mini form! Cozy Cabin would be adorable as a mini! The Modern Hex would be a great mini! And I absolutely love your quilt above. It’s gorgeous! Miss America or Solstice! This books looks great! I have enjoyed the blog hop so much! Beautiful quilt! I think Solstice or Modern Hex. Thanks a lot for the chance to win! Oh, that’s an easy one! I’d love to see Miss America in a mini version! Flirty would be SO cute (and probably challenging!) what will all those LITTLE pieces…that you enjoy SO much! LOL!!! I would love to see a mini Dahlia block for a mini. I’m thinking it would look amazing on my wall. :) Thanks for the opportunity to win! I pick Radiant as the mini pattern to be. Little triangles are so cute! Soltice!! Yes!! that would be super fun. Coming up Clovers would make a cute mini quilt! I would LOVE Dahlia in a mini form. I’m obsessed with minis – have been for years. I’m so glad they are coming back. I love whirlwind and would love to see it in mini form. I would love to see Square-rific block. Gypsy Caravan or Twinkle. Both remind me of embroidery samplers especially Gypsy Caravan. I love Dahlia! That would make a great mini!